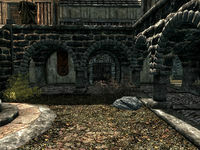 The Hall of the Dead is a small gravesite below the Temple of Mara in Riften. It serves as an embalming room where Alessandra, the resident caretaker, works. Upon entering the Hall of the Dead from Riften, to your right there is a small nook with a coffin that contains minor loot and to your left, a door leading up to the Temple of Mara. If you came in through the temple than to your right is the door to Riften. In the central room there is a dead Nord on a table. This is where you will most likely find Alessandra who tends to the dead. To the top left corner on the room is a Shrine of Arkay, which bestows the Blessing of Arkay for eight hours when used, as well as a few gold and perhaps a few blue and purple mountain flowers. Branching out from the central room are corridors that lead to a few coffins with minor loot and the urns of any NPCs that have died recently. The urns contain their belongings. Other than that the Riften Hall of the Dead is relatively empty. This page was last modified on 27 January 2016, at 23:59.